When you are offered a new job it is a very exciting time and you are keen to impress so it can be awkward to start negotiating contracts. However, to make sure you get what you deserve and are happy in your new employment, it is a step that needs to be taken. Approach the process in a professional manner and have good reasons why they should offer you what you are asking for. Be willing to discuss and negotiate but make sure you get everything signed and finished officially. It is best to leave discussions about contracts until after you have been offered and have accepted the job. Then it is time to start talking about the details and making sure that the company are willing to give you what you want. Be realistic about your demands but also be firm and have good reasons why you should get it. Talking about how much you earn or want to earn is never pleasant conversation, especially when it is with a new employer. By the time they have offered you a job you will have a good idea of what they are willing to pay you but there is still room for negotiation as many employers will suggest a salary range. Some people will advocate lying about what you got in your last job but this can be unwise if your new employer finds out. It is better to be honest but be able to give firm examples about why you should now be getting more. Benefits can range from the amount of holiday that you get to private health care or the terms of your contract. This is the area most open to negotiation as details are often not set in stone and can vary between employees. Again, it is a good idea to know what you would like and be able to convince them that you should get it. If one thing is much more important to you then focus on that and let other benefits go. It is all very well to negotiate you contract but you don’t want to push your luck too far. Being too demanding with your new boss may cause them to retract their offer of employment or start you out on the wrong foot. Be willing to negotiate and stay professional throughout. Know what you are willing to settle for and if you can’t get it, then know at what point you would be unwilling to continue with the job. Once you have negotiated the contracts and both sides have come to a reasonable agreement then you need to finalise everything. There is no point having agreed a contract if you don’t get it all signed off in writing. 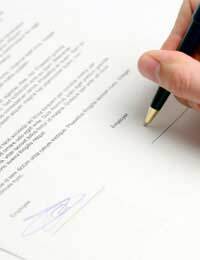 Before you sign anything, read the details thoroughly, including the small print, then make sure that your employer has also signed in the dotted line. When it is time to negotiate contracts, be professional but firm and know what you want. Whether it is pay, benefits or terms of employment, be willing to compromise and know when it is time to walk away. When the details have been finalised, read the contract thoroughly before signing and make sure your employer does the same. When I accepted my casual temporary contract I told my employer that I could not always work weekends because I have dependents. I have worked the odd weekend but find it hard and I have told my employer but they don't want to know. What rights do I have?